It looks like the long-rumored Kevin Love–to–Cleveland deal is actually going to happen. The T-Wolves and Cavs have agreed, in principle, to swap Love for Andrew Wiggins, Anthony Bennett, and a 2015 first-round pick. That’s a huge price tag for Love. But he’s worth it. In the space of six years, Love has evolved from a limited and timid rookie that averaged 11 points per game into one of the league’s premier scoring threats who also happens to be one of its dominant rebounders. Love entered the league as a relatively conventional big man, but these days his game is much harder to classify with basketball’s old positional taxonomy. Has there ever been a player who was both one of the league’s best rebounders and one of its most prolific long-range shooters? In his rookie year of 2008-09, Love banged around the paint and hardly ever took 3s. A vast majority (63.7 percent) of his shots came inside of 8 feet, and only 3 percent came from beyond the arc. By last season, his game, and those numbers, were completely different — only 36.9 percent of his shots came inside of 8 feet, and more than a third of his attempts occurred beyond the 3-point line. By the end of last season, his game barely resembled the one he had as a rookie. All players have their defining traits: LeBron James is a freak in the paint; so is Blake Griffin; Kevin Durant and Steph Curry are insanely accurate jump shooters. 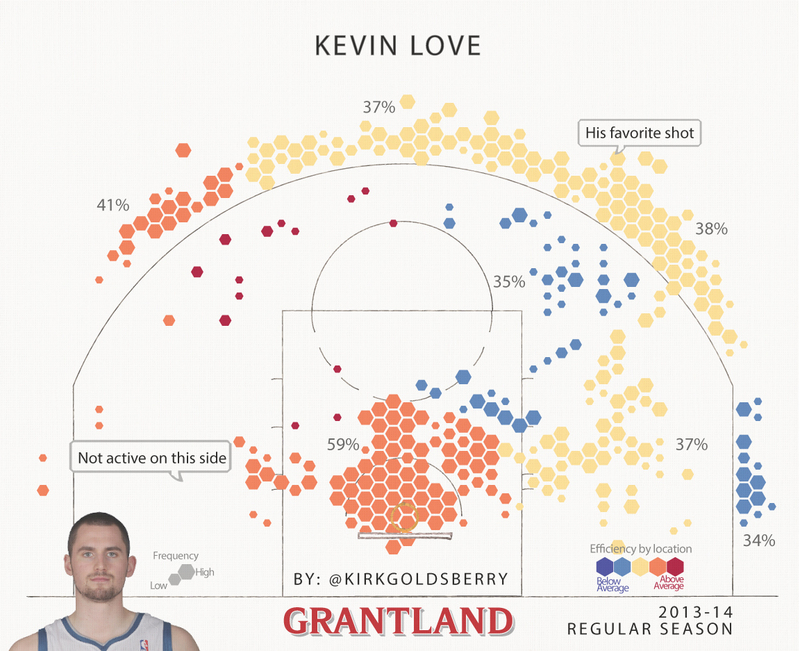 But Love’s shot chart reveals something strange: a shooter who is hyperactive but perhaps not hyper-efficient. As a 4, Love’s growing obsession with 3-point shooting is the most noteworthy aspect of his shooting behavior. Regardless of position, he is one of the league’s most active perimeter shooters. Only four players — Curry, Damian Lillard, Durant, and Love — took more than 450 shots “above the break” during the 2013-14 regular season.. Love’s favorite shot has become the left wing 3. During his rookie year, he took four shots from that area. Last season, he attempted 229 shots from the same zone, by far the most in the NBA. For context, J.R. Smith was second with 189 attempts. J.R. Smith: not a power forward, by the way. It’s not unusual for NBA power forwards to become jump shooters as they age. A reliable jumper is a great way to both stretch defense and offset declining athleticism. But Love is only 25. It’s fair to ask: Given his tremendous interior skill set, is his outward migration premature and/or too extreme? There are reasons why more power forwards don’t shoot nearly as many 3-point shots as Love does. First of all, most can’t hit them. Love deserves credit for developing deep range at such a young age. Even older 4s, like David West and LaMarcus Aldridge — both wonderful jump shooters — have yet to add 3s to their arsenals. Many teams prefer to keep their bigs inside the arc to help set screens and grab rebounds, the idea being that every time a big spots up beyond the arc means one less play in which he’s a factor inside of it, especially on the glass. After all, power forwards are the primary rebounding vultures in the NBA ecosystem — it’s generally their role, whether it’s on offense or defense, to clean up the corpses of failed field goals down by the rim. The fact that Love is one of the best rebounders in the game only compounds this issue. He’s not just “technically a power forward” like Channing Frye. This guy is way more Barkley than Bargnani. He’s a true interior force, and every time he shoots one of those 3s, one of the league’s top rebounders becomes a rebounding spectator. Every Kevin Love 3-point attempt introduces a sneaky hidden fee, and when you evaluate his 3-point value using only his shooting percentages, you don’t even see it. The fact is, offensive rebounding rate is in the fine print of every field goal proposition. Offensive rebounds are the redeemers of wayward jumpers, tickets to fresh shot clocks, and painful little heartbreakers for every defensive player on the floor. However, some kinds of shots are more likely to produce offensive rebounds than others, and it just so happens that Kevin Love’s perimeter jumpers have always elicited them at low rates. This is all tied to an idea I introduced way back in my first Grantland feature in 2012, but the numbers continue to back it up in 2014. It’s no shock that Minnesota was one of the league’s strongest offensive rebounding teams last season. This is because, with all due respect to Bukowski, Love is a dog from hell on the boards. Yet Minnesota’s offensive rebounding rate was tied to Love’s position on the floor, and whenever it was Love that was doing the shooting — especially the jump shooting — the Wolves morphed into a poor offensive rebounding team. Overall, NBA offenses reclaimed 29.9 percent of missed shots. But, as a team, Minnesota grabbed 32.7 percent of its own misses, which ranked fourth in the league. Furthermore, the Wolves grabbed 33.7 percent of their missed shots anytime the shooter was not named Kevin Love – this would have ranked them first in the league. However, the Wolves only retrieved 28.5 percent of Love’s missed shots, a value that would have placed 23rd in the league. The idea really gets driven home when you look at the team’s most active shooters and how often their misses turned into offensive rebounds. 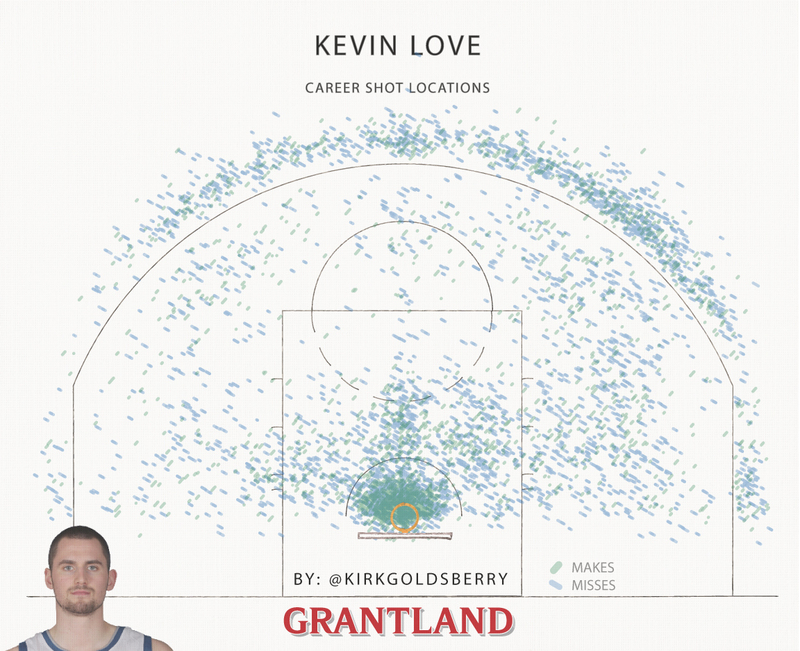 Love’s 3-point shot is impressive, but it’s also fair to ask whether the addition of a mostly average (at this point) long-range game to his shooting repertoire is a smart addition for his team’s overall offensive portfolio. It’s also important to note that on a Minnesota team lacking strong perimeter shooting from its guards and wings, Love naturally assumed a greater perimeter role than he might alongside different teammates, guys like Kyrie Irving, Dion Waiters, and Mike Miller. This is a case where our simplified obsession with field goal percentage (or points per shot) as a proxy for shooting effectiveness is itself defective. Not all field goal attempts are created equal, and you cannot judge a shot’s worth based solely on its probable point yield. Even when Love misses from short, good things happen. Love made 59 percent of his shots inside of 8 feet last year, and when he missed, the Wolves grabbed an offensive rebound a whopping 44 percent of the time. (The league’s offensive rebounding rate in this area is 38 percent.) For every 100 close-range shots that Kevin Love attempted in the 2013-14 season, 77 resulted in either a made basket or a fresh chance for his team. His missed shots were like blood transfusions for the Wolves offense. Flipping it on its head, only 23 percent of his close-range attempts resulted in a failed possession. Oh, and don’t forget that he gets fouled a lot, and a vast majority of the league’s fouls occur close to the basket. Conversely, Love induces a lot more failed possessions when he takes jumpers. Outside of 8 feet, his team recovered his misses only 23 percent of the time. This figure is identical for both midrange and 3-point misses. In the midrange, for every 100 shots that Love attempted last season, 47 resulted in failed possessions. Although Love rebounded 112 of his team’s missed jumpers last season, only three of those came off of his own misses. But he rebounded 37 of his own missed close-range shots. It’s no wonder that when Love misses a close-range attempt, his team is generally in great shape to grab the board; Love is necessarily and conveniently already placed in the rebounding area. At 25, Kevin Love’s career has come to a turning point. He’s heading east to Cleveland, and that will make his life easier, in more ways than one. First off, it will get him out of that bloodbath the NBA calls its Western Conference. He will see less of Tim Duncan, Blake Griffin, LaMarcus Aldridge, Serge Ibaka, Zach Randolph, and Anthony Davis. Second, he will be paired with LeBron James, the league’s ultimate rising tide. Alongside James, open shots are easier to come by, there are fewer double teams, and there are more fast-break points. Lastly, and perhaps most relevant to his perimeter habits, a move to Cleveland will also put him alongside Miller, Irving, and Waiters. Relative to Ricky Rubio and Corey Brewer, these guys are all sensational jump shooters, and would likely represent the best 3-point shooting corps that Love has ever played with. With Love’s move to Ohio, it’s hard to imagine anything but upticks in efficiency and downticks in his perimeter shooting. He’ll be in the middle of a much stronger offensive environment, chock full of better opportunities and easier matchups than what he saw in Minnesota. But perhaps most of all, he’ll be in a place where he can focus on his most important skill set — cleaning up on the glass. For the first time in years, he won’t be his team’s primary scoring option — he will be their primary rebounder.